Tangible printed product catalogues remain one of the oldest and most powerful forms of marketing mediums. Catalogues are going through a renaissance because of the versatility and practicality of the printed publication. In a world where anybody can launch a website, the expertly custom product catalogue design is highly valued by marketer and customer alike. 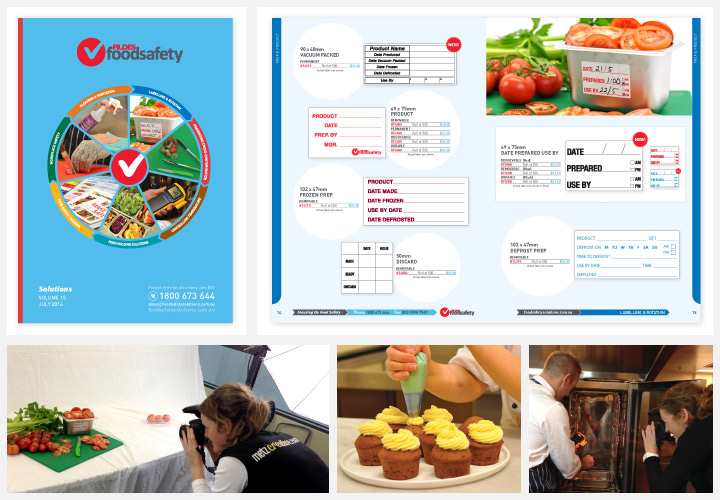 A good example of this is the product catalogue design our studio is developing currently for Fildes Food Safety, they supply a broad spectrum of food safety items too Australian and New Zealand food operations, from the local restaurant to the largest food chains like McDonalds and Subway; from nursing homes to hotel chains; from childcare facilities to food distributors. Fildes engages in our graphic design creative services to update their product catalogue each year and for the previous 5 years, the catalogue is marketed and supplied to the hospitality service industry, this particular market is more inclined to use the catalogue as their bible, often flicking through the catalogue on a kitchen bench as they work or catch a quick break. The ordering process still includes the method of calling and placing your order, and obviously now includes an order online option, but i am told by Fildes General Manager Brian Burke that a higher percentage of orders are taken by phone rather than online, which highlights the argument even more to keep a focus on providing your customers with tangible well designed printed material to keep them engaged in your brand, product and services. Especially when marketing to certain industries that are more likely to browse through printed material than to get online. Now that we have assessed the value of the product catalogue we also need to comment on the importance of the design and layout of the catalogue, in this particular instance Fildes have briefed us to change up the creative a little for this years design, give the overall layout a slightly new look without taking away from the brand too much. This is always a challenging balancing act, freshen up the design and overall appearance, v's keeping the brand consistent from year to year. In conjunction with the marketing team at Fildes we believe we have executed the brief to perfection for volume 15! see below screen shots of our work in progress. The catalogue is due for allocation to 1000's of food distributors all around the country in July 2014. Did i mention our team also photographed all the products and lifestyle imagery in the catalogue? this is another service we believe is of great value to offer our clients as often we take certain shots to suit the design and layout of each page, especially for product catalogues and any marketing material that requires custom photography. Metz Creative can custom design, Photograph and develop your next product catalogue.